Marquis is plunging into double promotion at the UK Pool & Spa Expo and SPATEX exhibitions to highlight its collaborating with six-time Ironman World Champion Dave Scott to help retailers promote its new Aquatic Training Vessel in the flourishing swim spa market. 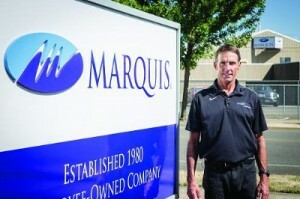 As part of the launch campaign to help the global network of Dealer Direct retailers to promote the new ATV, Oregon-based Marquis Spas has team up with Dave, pictured, the First Inductee to the Ironman Hall of Fame, to provide online exercise guidance with a dedicated training video section on its website. Marquis Vice President, Marketing, Jim Johnston has been heavily promoting the launch of the new ATV at major international exhibitions in the USA and Europe ahead of two West Midlands exhibition appearances to target the British market at the UK Pool & Spa Expo and SPATEX with its flourishing Dealer Direct strategy. The ATV, which comes in at 168.5” x 89.5” x 56” and was officially rolled out to the wet leisure trade at the International Pool Spa Patio Expo in Florida in November, has been produced with ultra-strong bonded polymer resins that are used in the construction of the marine industry’s most expensive and rugged boat and yacht hulls. “The current partnership with Dave Scott will offer ATV owners, who are focused on training, several ‘how to’ video sessions,” revealed Jim. “In the videos Dave will focus on user benefits for people training for competition, pursuing higher fitness, working on injury rehab, or generally improving their overall health. 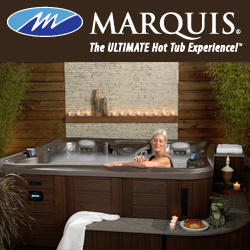 The Marquis exhibition stands at the NEC in Birmingham and Ricoh Arena in Coventry will also be promoting increased UK sales for the iconic brand that is currently enjoying flourishing demand for the Microsilk technology in its hot tubs and increasing popularity for its entry-level product line, Celebrity Hot Tubs. This range includes the ‘plug and play’ Broadway that comes in at 77” x 77” x 34” and has creative seating that can accommodate five people. Within a design that features a wraparound seat for two people there is a deep ‘Director’s Chair’ with provision for enhanced leg therapy. Other models in this thriving stable include the seven-seater Vegas, which comes in at 84” x 84” x 34”; the six-seater Hollywood, which has the same size specification; and the round Napa, which can accommodate six people and is 76” round and 34” high with five dedicated therapy seats. “Our main strategy focus during the economic downturn was to provide investment in our production redevelopment and we now are reaping the rewards,” said Jim. Marquis, who achieved a 2014 WhatSpa? Best Buy Award in the £6,000 to £7,900 category for the best-selling four-seater Spirit model, will be appearing at the UK Pool & Spa Expo on Stand 100 and at SPATEX on Stand C63a. UK Pool & Spa Expo 2015 opening hours for the first two days of the show, on January 22 and 23, will be between 10am to 5:30pm. On Saturday, January 24, the third and final day of the UK Pool and Spa Expo is the Consumer Day that will be staged between 10am and 3pm for exhibitors in Hall 10 to meet with members of the public as well as trade representatives. SPATEX 2015 opening times for the first two days of the exhibition at the Ricoh Arena will be 9:30am on Sunday, February 1 and Monday, February 2. Both days are then scheduled to officially finish at 5pm. In keeping with tradition, there is a shorter day on the third and final dedicated ‘Spa Day’ on Tuesday, February 3, which will run from 9:30am to 4pm. Filed Under: Event news, Events & expos, Manufacturer interviews, New products, News, News & views Tagged With: Aquatic Training Vessel, hot tub retailers, Marquis Spas, SPATEX, UK Pool & Spa Expo, WhatSpa?